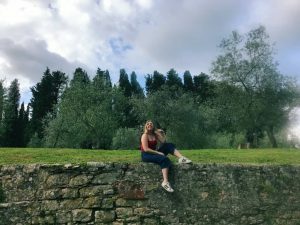 We caught up with SAI Ambassador Elizabeth, who reflects on some great memories from her semester in Florence. Study abroad was not just visiting new places and living in another country, but believe it or not studying. One class that made my experience more special was one called Florence Sketchbook. I had always loved art and drawing so I figured an entire class about sketching would greatly help my artistic abilities. Not only did we sketch in class, but the teacher brought us all around Florence; we drew in parks, piazzas, and even cemeteries. This made Florence feel more like a home because I was not just sitting in a classroom studying, but actually walking around the town learning about churches and old monuments. Plus my sketches made great souvenirs. Not only was I able to bring but physical souvenirs but my memories living in a European city are one’s I will never forget. One of the most memorable interactions with a local in Florence was when I went out for lunch with my roommate. We found this great hole-in-the-wall restaurant where the menu was whatever the chef wanted and you literally ate in the kitchen. We were all seated family style and we got talking to an elderly couple next to us. With out limited Italian, and their limited English, we learned that they grew up in Florence but had recently moved to the lake district and were back visiting on holiday. It was amazing learning about their lives and interacting with someone in another language. 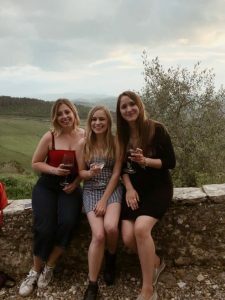 Me and two other SAI student’s enjoying the views of Tuscany while on a wine tasting tour. At one point, the man (named Dante) dropped oil into his lap and we introduced him to the wonder that is a Tide to Go stick. He was so grateful after he even bought us all a round of vin santo and cantucci. 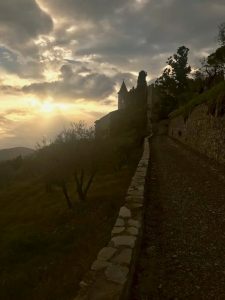 For any student looking to learn the language abroad I would say just go for it. You will not learn if you do not try. Most of the time people will be so grateful that you are attempting to learn their language and not just assuming that everyone speaks English. If I had not tried to learn Italian then I would not have had such memorable times interacting with locals. It made me part of the culture, and not just a tourist. Me, in Fiesole, enjoying some greenery. 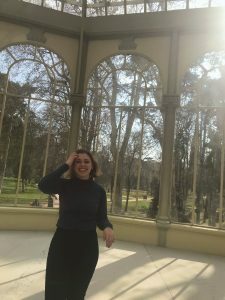 Elizabeth was an SAI Florence spring 2018 student from Muhlenberg College.